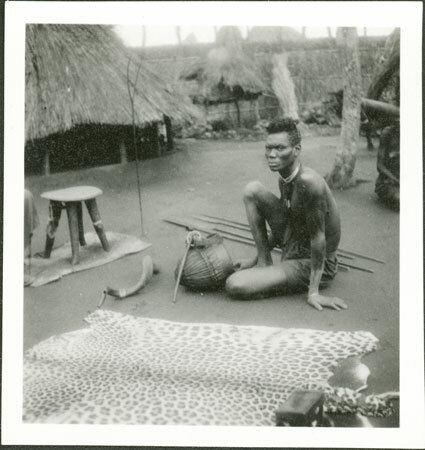 Just out of frame is King Aguaa-war-Akuon of Obuodhi village, sitting in his compound. The subject of the photograph however is a young man sitting with some of the royal emblems: a royal stool standing on a skin, spear-rest, four spears lying on the ground and a drum. Five bead necklaces worn by Aguaa should also be included. Notes on print/mount - "44 4 177"
Morton, Chris. "Anuak royal emblems" Southern Sudan Project (in development). 03 Jan. 2006. Pitt Rivers Museum. <http://southernsudan.prm.ox.ac.uk/details/1998.342.187.2/>.